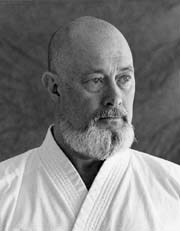 CHUCK MERRIMAN, Kyoshi, 8th Dan, Okinawan Goju-Ryu Karate. A Pioneer of Goju-Ryu in the United States, he was named Instructor of the Year in 1980 by Black Belt Magazine. He is a student of and the U. S. Director for Eiichi Miyazato, 10th Dan and President of Chuck Merriman's Karate International and Vice-President of the World Union of Martial Arts Federations, and a member of the Executive Board of the International Karate Kobudo Federation. He has also been a leading force in training teams representing the USA in international competitions. He is also a IKKF San Ju Nen Kai member.